Casa de Cisneros at number 4, Plaza de la Villa, was built in 1537 by the nephew of Cardinal Cisneros, the man who founded the University of Alcalá. Benito Jiménez de Cisneros, the nephew, built Casa de Cisneros on the southern side of the wonderfully peaceful and quiet Plaza de la Villa in the historic centre of Madrid to the west of the city centre. A striking statue of Álvaro de Bazán standing on a white pedestal occupies the central part of Plaza de la Villa. Bazán was commander of the ill-fated Spanish Armada, known as the Invincible Armada in Spain. The pedestal was designed by the architect, Miguel Aguado, and the statue was created by sculptor, Mariano Benlliure. The combined pedestal and statue stand an impressive three metres tall. Casa de Cisneros is the second oldest building in Plaza de la Villa. 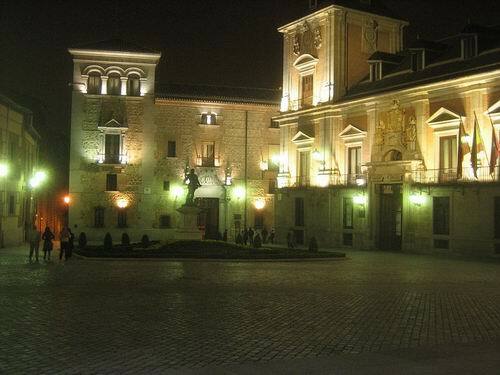 The Torre de los Lujanes is the oldest structure in the square, and probably the oldest building in Madrid. Parts of it date back to the early 15th century. Casa de Cisneros has a Plateresque decorative frontage design. This is a style derived from the late Gothic period of Castile, and the example at Casa de Cisneros is almost unique in Madrid. The building is located at the southside of the square and can be seen in the photograph above together with the Casa de la Villa, which is to its right. In 1590 it served as a refuge and prison for Antonio Pérez who was fleeing from Philip II. Pérez was secretary to the king and he spent some time imprisoned in the house. A stunning collection of tapestries can also be found housed in Casa de Cisneros. Ramon Narvaez Maria y Campos, first Duke of Valencia, a military man and a politician of Spain, once lived in Casa de Cisneros. He is one of the more famous people who died there. His death was on April 23rd 1868. In the early 20th century, two architects, Bellido and Luis Gonzalez, did some restoration work on Casa de Cisneros. They also created an arched passageway that connects between Casa de Cisneros and Casa de la Villa. You may visit Plaza de la Villa and Casa de Cisneros by the Madrid Metro. The Opera station, lines 2 and 5, is the nearest, and a short distance to the north. Sol, lines 1, 2 and 3, a little further away to the east, is also within reasonable walking distance. City bus number 3 will also take you there.